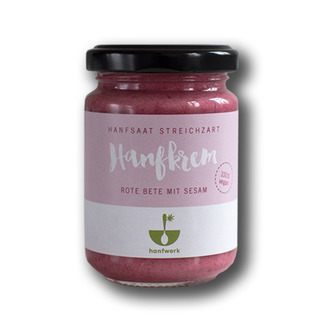 Hemp Spread "Beetroot-Sesame" is a vegan hemp-based spread, which has a fruity flavour combined with the earthy taste of beetroot. Hemp Spread is based on a creamy mass of hempseeds and water. Hempseeds are nutritionally very valuable, especially because they offer omega-3 and omega-6 fatty acids (ratio 1:3) and protein which consists of all the amino acids you need. Further, hemp is a great crop plant because it can be grown almost everywhere in the world and needs only few fertilizer and neither herbicides nor pesticides.